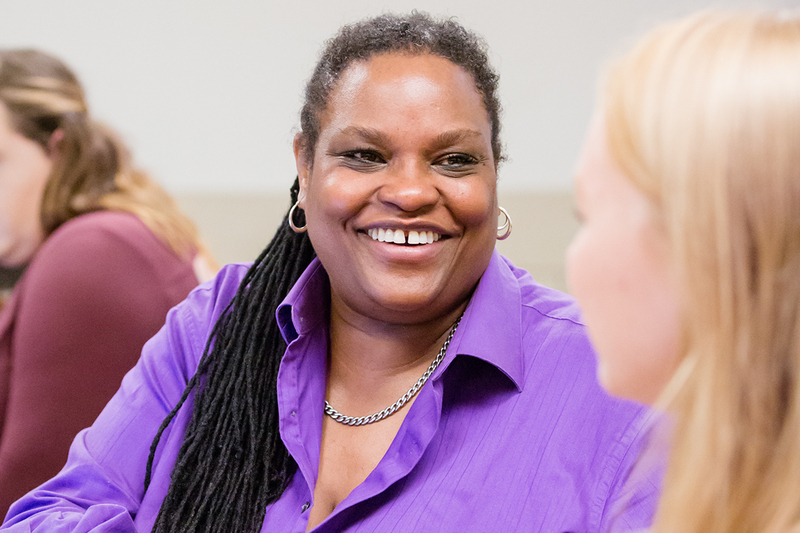 Journalism professor Janice Collins, advising students in a meeting, said she started Hear My Voice to provide "a platform where we can all come together to learn." The University of Illinois at Urbana-Champaign is big and it’s diverse, with students from many backgrounds and with many points of view. Students often find a home within that expanse, but can also easily feel marginalized, without a voice, not part of the culture. a student can feel even more on the margins. So where might such students find a home? Janice Collins, a U. of I. journalism professor, thinks one place is in a news website where students can tell stories and find resources not common in other media. Another is in creating spaces and events for diverse, inclusive and respectful conversation. Both fall under the banner of Hear My Voice (hearmyvoiceonline.com), which Collins started in spring 2016. 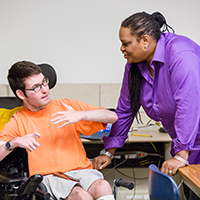 Student reporter Avi Samuels, discussing a point with professor Collins, joined Hear My Voice because he wanted to make the case for treating people with disabilities on an equal plane. The idea arose from hearing about students “having more and more issues with depression, anxiety, feeling invisible – not really knowing where to have their voices heard in a way that will make positive change,” Collins said. She’d heard similar things from an academic adviser. And she had concerns, as well, about issues causing tensions on campus. She saw disconnects between students and administrators, between the campus and the community. She wanted a central location for “demarginalizing the marginalized,” chiefly by reporting on issues and sharing opinions. Hear My Voice brought in not only journalism students, but also students from a variety of other majors, as well as contributors from beyond the campus. 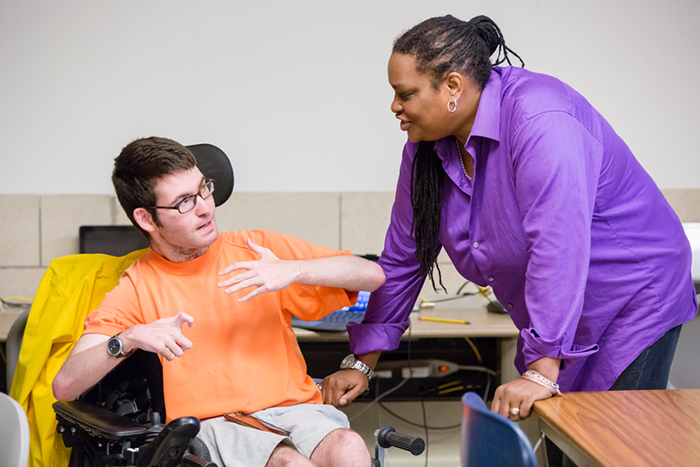 “I started getting students just wanting to be a part of it, and not just to have a voice. They wanted to be a part of something that they felt was a positive, proactive step toward healing this community,” Collins said. a junior in liberal arts and sciences from Buffalo Grove, Illinois, who came to an informational meeting early on, then joined the team as a student reporter and content creator. 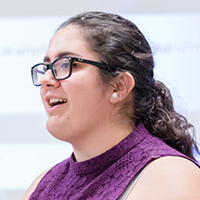 Indira Midha’s biracial background helped shape her interest in the website and organization, as did her blogging and concerns about social issues. 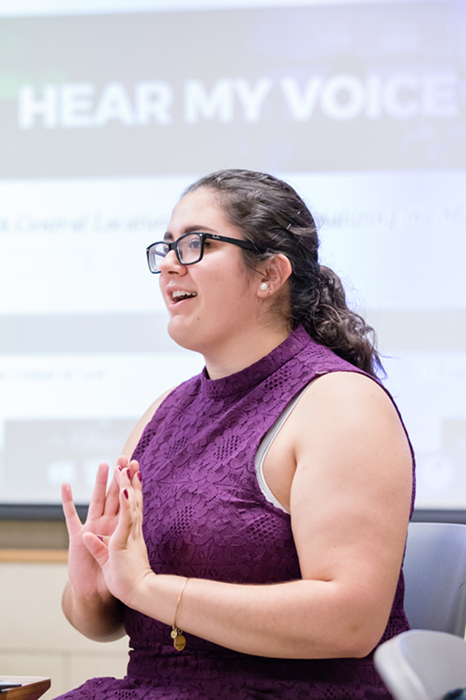 Another student participant was Indira Midha, a sophomore in media and cinema studies from Schaumburg, Illinois, who showed up at a Hear My Voice meeting early in the spring semester of her freshman year. With immigrant parents from India and Spain, she hadn’t found a comfortable fit with any particular group in high school. “I felt like I didn’t have a voice. I felt very invisible,” she said. As an outlet, Midha had started a YouTube channel, then moved to blogging, where she addressed issues like social activism and female self-image. So maybe it was no surprise when Midha left her first meeting feeling inspired by Collins and wanting to play a part. Midha is now the student president of the Hear My Voice registered student organization, which organizes events like a diversity fest last spring. A look at the Hear My Voice website shows that Collins and her team don’t want it pigeonholed as representing one viewpoint or set of concerns. The subjects range from club sports to hate crimes, biracial identity to pro-life protest, and Middle Eastern stereotypes to freedom of speech. Collins spent more than two decades in the news business, primarily in television, before coming to academia. She teaches courses in broadcast journalism, multimedia storytelling and leadership development. And teaching journalism is central to the process of selecting and editing stories for the website. In fact, Collins and Hear My Voice each received awards at the August convention for the Association for Education in Journalism and Mass Communication. The general idea is for individuals to accept what is special and unique about themselves and use that to move from the margins to a place of empowerment. Instead of feeling limited or victimized by surface characteristics or experience, you use them as your strengths and a means for relating equally with others, Collins said.